The line between the past and present blurs in ranching country, so even a Canadian like me shouldn’t have been surprised to see the handgun. When a log ranch house by North American Log Crafters was included in the Missoula Parade of Homes we were invited to be on hand to answer questions. A road trip seemed like a good way to experience a few western states and we loved Montana with its big open sky. Even at 80 mph the rolling hills seemed to go on forever. It felt a lot like our BC interior home, but better: there was no sales tax, Walmart sold wine and people drove ATVs around the streets. Everyone we met was friendly and the meals we ate were inexpensive and hearty. The owners welcomed us with classic western hospitality. The ranch house was a big hit: the Wild West rendition of the American Dream. 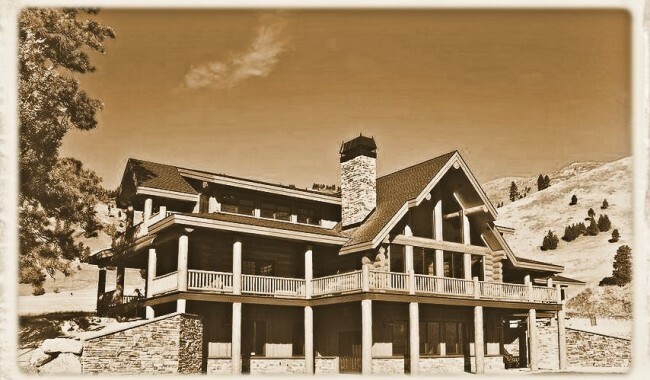 “Standing proud in the fore front of its Montana working ranch, the T. Lee Rose is a 6850 square foot log home that pays attention to her stunning 360 degree views of Montana’s finest cowboy country. It is the care and craftsmanship of her builders that is evident everywhere, from the 15 inch Douglas Fir logs skillfully crafted in Canada to the hundreds of details including a concrete hearth, hand hewn mantel, bronze countertops and hanging beds that truly brought this home together. The open floor plan has been laid out to minimize the work for the ranch with mud room entries and a laundry on every floor. A professional kitchen with a large island and walk-in pantry boasts plenty of seating for extra hands, welcoming them as well as family and friends. It’s the kind of home you want to host Christmas in for your entire family—for your children and their children too. The various craftsmen and trades involved in the construction reminisced about the project and explained their workmanship to crowds of admiring visitors. I played only a supporting role and standing beside my log builder husband left me with a sore back after a few days. I changed into hiking clothes one afternoon and headed up into the hills behind the ranch. Like everything else in Montana, this challenge was bigger than it first appeared. I’m a Canadian–I’m used to wildlife! An American chuckles at my pepper spray. We left Montana with memories of a state full of big spaces and people with big hearts; the great ranch house built with stalwart Canadian logs fits right in.